A sort of orienteering treasure hunt! Buoy to buoy navigation under sail. 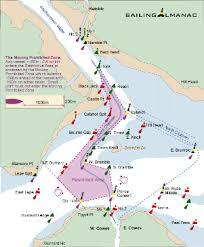 Use the wind and tide to visit as many buoys as you can around the Solent. Some buoys score higher than others, so it’s all about the planning. The full price for the weekend is expected to be around £180 with a full complement of crew and a club skipper. An initial non-refundable deposit of £50 is required to secure your place on this trip. To register for any event, you will need to be a Member or Temporary Member. To register for Temporary Membership click here.